How can I find the best patent applications to challenge (by requesting prior art)? What is the best way to find/search/browse questionable patent applications so that I can then search for prior art to be submitted to the USPTO. 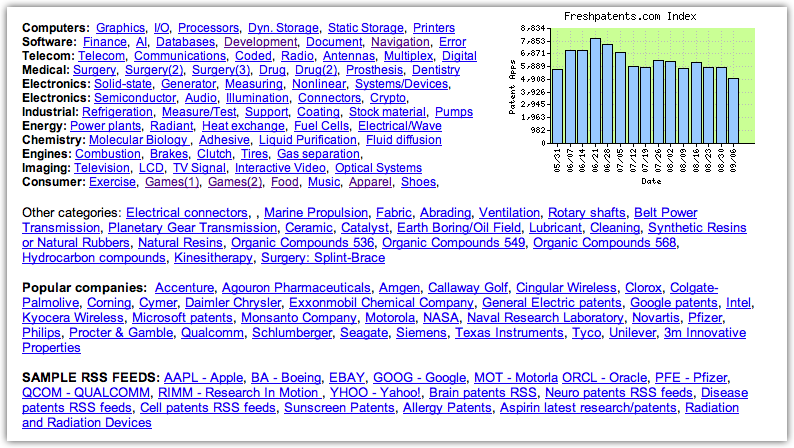 I'm familiar with Google Patent Search but it's very open ended if I'm not looking for a specific patent/application. I'm interested in turning up fresh, potentially troublesome patent applications before they've been approved, so that we can take a crack at vetting them first. The UI is kinda ugly compared to Google's, but the actual data available seems to be a little ahead of what's listed on Google at the moment, so you're getting notified of patent applications fairly quickly after they've been published. By trolling (pun intended) - search tech news sites for the names of well known NPEs. They usually hit dozens of victims with the same patent (or family of patents). It appears that there are only a few patent abusers, they may hide behind different names but it seems to be a small group. It doesn't take long to find questionable patents once you find questionable IP lawsuits. Chances are all those patents will end up in re-examination, so if you get the jump on them and line up the prior art, they lose. I think you should take a look at http://www.freepatentsonline.com/ which has alerts, subject matter preset searches/reports and automatic periodic searches and which also covers Japanese, European and WIPO patent documents. It's free and very sophisticated. It's related commercial search site is Cobalt IP. Another useful site is http://www.priorsmart.com/ which links to many of the patent search engines throughout the world and is intended to help locate prior art. How to find the best prior art? Who are the folks here and how are our answers used? What Type of Questions is This Site For? Is there any way to accomodate historical licensing questions regarding expired patents?